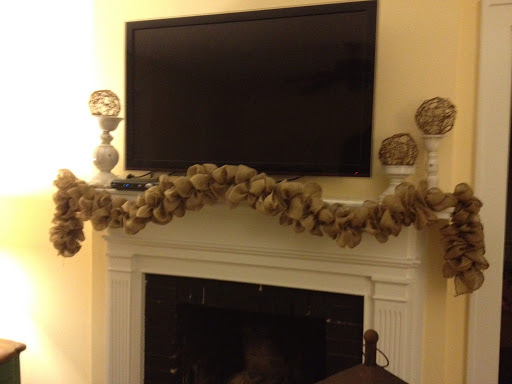 My husband wanted to put the TV on the mantle, but I thought it just made the mantle look so drab. In this post I will show you how to make garland burlap which took my mantle from blah to southern and homey! Start by tying the string in a knot around the safety pin. Cut the string about 4 feet long. Tie the opposite end of the string in the bottom right corner of the burlap ribbon. Begin to weave the string through the burlap, in and out in a zig zag pattern up the ribbon. The wider the pattern the bigger the puckers, and visa versa. About every 2 feet, tighten the string so that the ribbon bunches. Continue until you have reached the length desired for the garland. 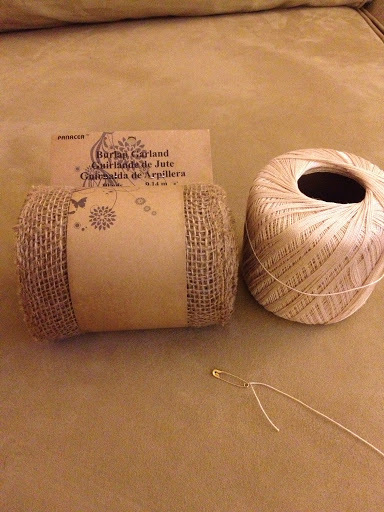 When finished, loop the string through the burlap ribbon and tie a knot. And you are done! I draped mine across my mantle, but this would look awesome draped over a doorway, the back of your buffet or a table runner! safety pin…bobby pins go in your hair….lol nice tut though! You list as supplies a bobby pin but in your picture you used a safety pin. Which is it? This is an excellent idea. Thank you for sharing it. 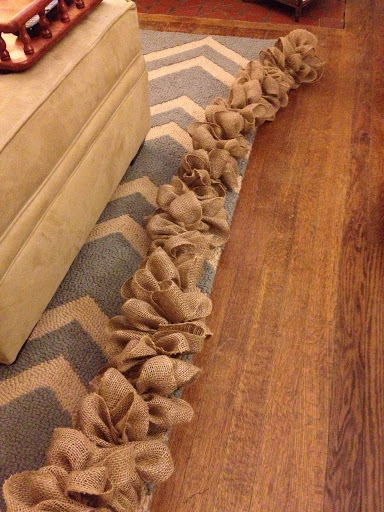 Do you actually use 30 yards or 30 feet for this garland? Love the garland, and thanks for sharing! Will the safety pin not leave big holes in the burlap? Will the safety pin not leave big holes in the burlap from where the closure part goes through? No, burlap ribbon has big holes anyway, but I would use the smallest safety pin you can! Sounds like you could easily use a darning needle instead of a safety pin. It seems that it would be easier. Love this idea! Will be doing it with friends at our craft party! THANKS for the tutorial!! I am using burlap to decorate for my Christmas Open house!! I SO needed this. THANKS! Could you please verify the amount of feet or yards you used? I used 30 yards (3 packets of 10 yards from Michaels). How long was your finished product using 30 yards. I just made it and used 30 feet by mistake and it took all of the 4 feet of string. I would not have had room for 30 yards. You can add more string by knotting the two ends together. Since the string isn’t seen, keep adding string until the garland is the length you want. BYW, I used an uoholstery needle. Worked much better than the safety pin. The rug is from target! They have awesome patterns and for a good price! This burlap isn’t wired is it? How long was your finished garland with the 30 yards? Darling idea, thanks for sharing!!! What is the length of the finished garland when you use 30 yards of ribbons? Was your burlap ribbon wire edged? It turned out beautiful! Hello! No the ribbon is not wire edged! I used a yarn needle and kite string. Love love love how it turned out. I made several garland strands and put it on our Christmas tree. Thank You your instructions were great. Can you wash burlap? I love the look and hate the smell. The ribbon really doesnt have that burlap smell, but you might could hand wash.
Couldn’t find where you answered the question of finished length. How long was your garland when you finished? I have a specific length I need to make overall and was just trying to figure out how many yards to buy initially. Awesome idea and thanks for sharing. Hello! 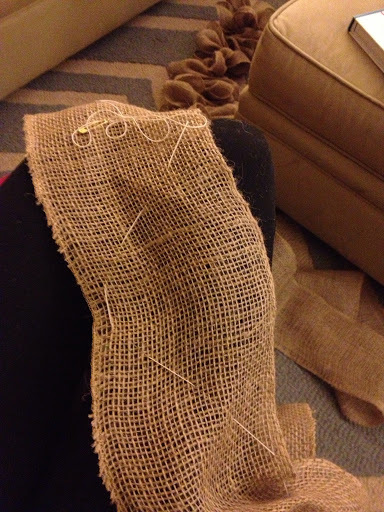 My burlap measured about 72 inches…but i could have kept adding if I wanted. Gallery wall with some treasures… How-to! Faux deer on the mov… on Faux deer mount…How-to!